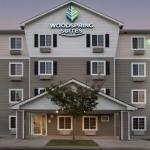 WoodSpring Suites â?? Augusta/Fort Gordon is set in Augusta 12 km from Cedar Grove Cemetery and 5 km from Confederate Monument. Every room comes with a flat-screen TV. Some rooms have a seating area where you can relax. Rooms have a private bathroom. Augusta State University is 6 km from WoodSpring Suites while Fort Gordon is 1 km from the property. Augusta Regional at Bush Field Airport is 14 km away.